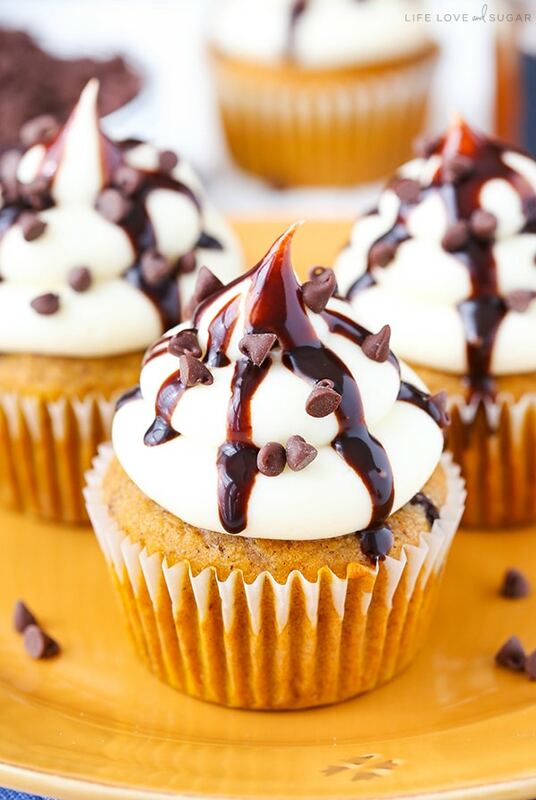 These Pumpkin Chocolate Chip Cupcakes are made with a pumpkin spice cupcake that’s full of chocolate chips and topped with a cream cheese frosting! They are the perfect way to cure your pumpkin craving this fall! Oh my goodness, it’s officially starting to get cold here and I’m simultaneously thrilled that it’s cooling down and terrified for the cold weather. It’s getting down into the 50s at night and in my world that’s quite chilly. We haven’t made the jump to turning on the heat since it’s still warm during the day so I’ve been piling on an extra blanket at night. That also means it’s chilly when I wake up in the mornings and it is quite the deterrent to getting out bed and out of the warmth. Preheat the oven to 350 degrees and line a cupcake pan with cupcake liners. Add butter, oil and milk to a large mixer bowl and whisk until smooth. Add the brown sugar and whisk until smooth. Add the vanilla extract and eggs and whisk until smooth. In a separate medium-sized bowl, combine the flour, baking powder, baking soda, cinnamon, nutmeg, ginger, cloves and salt. Fold in the pumpkin puree and chocolate chips until well combined. Fill each cupcake liner about ¾ full. Bake cupcakes for 21-23 minutes, or until a toothpick inserted in the middle comes out with a few crumbs. Remove cupcakes from the oven and allow to cool for 2-3 minutes, then remove to a cooling rack to finish cooling. Combine the cream cheese and butter and mix until smooth. Add the vanilla extract and mix until smooth. Use a large round piping tip to pipe swirls onto the cupcakes. Top with a drizzle of chocolate sauce, if desired. 0 Response to "PUMPKIN CHOCOLATE CHIP CUPCAKES"